Will Smith admitted that Durham’s five-wicket Royal London One-Day Cup defeat to Warwickshire Bears last night was “hard to swallow”. Despite posting 299-8 in their 50 overs, the Jets slipped to a five-wicket defeat at the Emirates Riverside to drop to second-bottom spot in Group A and dash their qualification hopes. 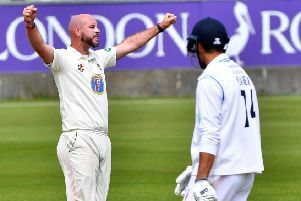 Smith to-scored with 119 for Durham and he admitted: “I would have taken a duck to be on the winning side rather than losing, particularly on a game that was verging on a must-win in terms of qualification. On the defeat, Smith added: “It is hard to swallow. We got 300 which is a ball-park figure for 50-over cricket on a decent wicket. “There were areas where we could have squeezed out a few more runs in hindsight. Matchwinner Bell said: “It was a well-timed run chase. It’s quite a difficult field to defend here. “There are a lot of twos out there and it’s a quick outfield. We stuck at the pace of the Duckworth-Lewis method on the scoreboard. 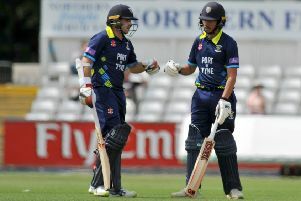 “Trotty and myself knew we had a time in the game when we wanted to kick on and try to get that rate below a run-a-ball. It went exactly how we wanted it to go. “When you come here to Durham, there’s always a little bit in the pitch. “You know you’ve got to be watchful and to play very straight. Durham host fifth-placed Notts tomorrow (11am) before finishing their campaign away to Leicestershire on Thursday.